After completing a song sequence involving 90 dancers, in Delhi, the Yeno Onthara team is back in Bangalore. "Ganesh and Priya Mani shot for a few scenes for over 10 days," says director Mahesh of Mussanje Maathu fame. With 80 per cent of the movie almost done, only the songs to be picturised in Chickmagalur and Greece are remaining. Yeno Onthara is Kannada remake of the Vijay-Jyothika starrer Kushi. The tunes of the original have been retained in the new version. Harikrishna is the music director. While the Tamil original has been remade in Telugu and Hindi with the same title, filmmakers had to opt for a different one as there already existed a movie by that name in Kannada. 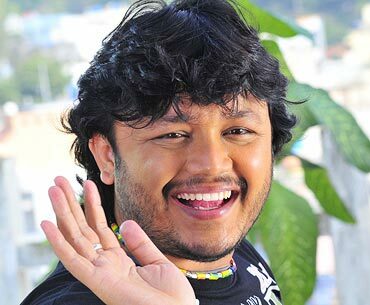 Yeno Onthara is in fact a popular song from one of Ganesh's earlier movies Hudugata. The song was sung by Shaan and Shreya Goshal. The two main protagonists of Yeno Onthara are very egoistic individuals and the director feels that there could have been no better choices than the 'Golden Star' and Priya Mani as they have the required look. Ganesh is shown in an entirely different light, he claims. "In this movie, you'll see a very sophisticated Ganesh," adds Mahesh. Jai Jagdeesh, Sharan, Tejaswini, Srinivasamurthy and Vijayalakshmi Singh, who will be seen acting after a long gap, form the rest of the cast. Yeno Onthara is Priya Mani's second Kannada film. Her maiden Kannada venture Raam saw her opposite Puneeth Rajkumar. If the new movie succeeds, it will not only help the actress gain a stronger foothold in the Kannada industry, but also help Ganesh reclaim his number one spot after disasters like Bombaat, Sangama and Circus.